SRTS refers to a variety of multi-disciplinary programs aimed at both increasing the number of students walking and bicycling to school and reducing the number of vehicle trips associated with school travel. Programs, activities and projects improve traffic safety and air quality around school areas and address childhood obesity and public health issues through education, encouragement, increased law enforcement, and engineering. SRTS efforts are led by partnerships among municipalities, school districts, community members, parent volunteers and law enforcement agencies. » Engineering – Design, implementation and maintenance of infrastructure that improves safety along school commute routes. » Enforcement – Strategies to deter the unsafe behavior of drivers, bicyclists and pedestrians, and encourage all road users to obey traffic laws and share the road. » Education – Outreach and lessons that teach students and parents traffic safety skills and the benefits of active modes. » Encouragement – Events, clubs, and activities that encourage more walking, bicycling, or carpooling through fun activities and incentives. ​» Evaluation – Surveys and hand tallies track progress toward program goals, assess successes and identify ways to improve programs. 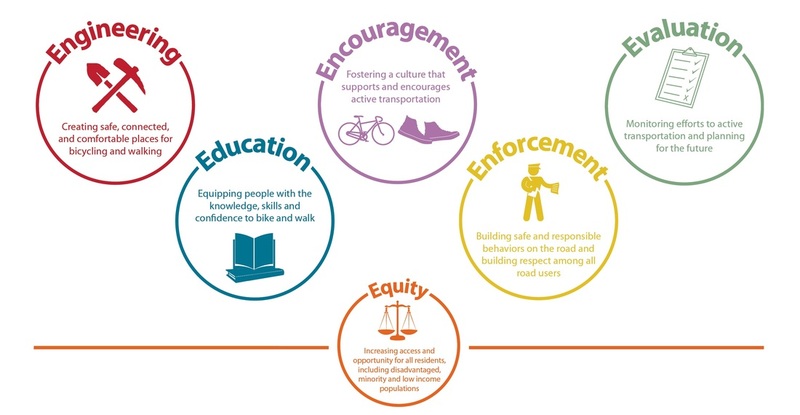 ​» Equity- An assessment of the distribution of impacts (benefits and costs) of bicycling programs, policies, and infrastructure improvements, and whether that distribution is appropriate.